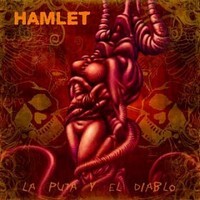 Hamlet are active since 1987 and so the Madrileños are one of the pioneers of this genre in Spain. They started playing traditional heavy metal, but now as their 9th album is released via Roadrunner their style changed. La Puta Y El Diablo was released in Spain last year and the album was preceived quite well. But what will the fans outside Spain think about it? They spiced up their traditional heavy metal with a dash alternative, groove parts, thrash elements and some hard rock-like melodies. And they peppered up this melange with aggressive riffs and double bass drum beats - and so the 10 songs offer some variety. At No Habrá Final they slow down and focus on acoustic sounds. The album has a good flow and singer Molly knows how to use his voice - sometimes aggressive, sometimes harsh, whatever the song demands. Don't be scared off by the Spanish lyrics, this language works well with metal. And with the Spanish lyrics they distinguish themselves from the majority. A good production as the basis for Logan Mader's mix and mastering. Mr. Mader was responsible for the powerful, fat sound of Machine Head and so soundwise their is nothing to complain. I can just hope that this Spanish band gets the attention they deserve, coz the songs of La Puta Y El Diablo are more then just decent. Give Hamlet a fair chance!